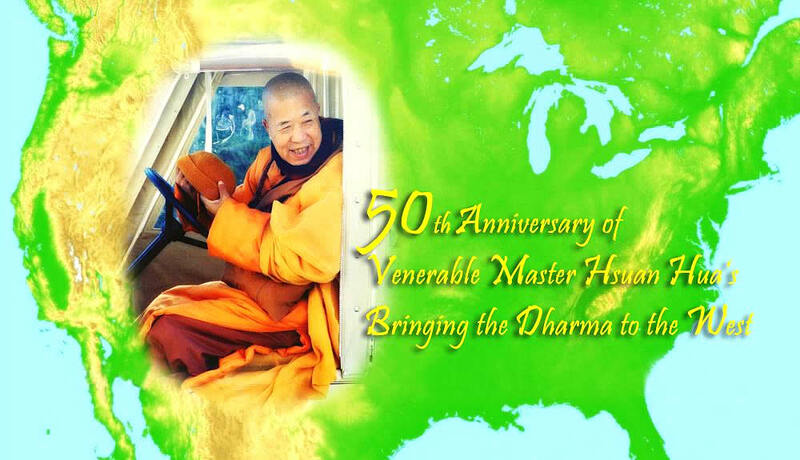 2012 is the 50th Anniversary of Venerable Master Hua’s bringing the Proper Dharma to the West and to the World. It’s also the 17th Anniversary of Venerable Master Hua entering Nirvana. Various events will take place at the City of Ten Thousand Buddhas (CTTB) on June 23 to celebrate Venerable Master Hua’s bringing the Proper Dharma to the West and to the World. On June 24, ceremony will be held to honor the 17th Anniversary of our founder’s entering Nirvana. Many of the first-generation disciples of Venerable Master Hua in the U.S.A. will be invited for conversation and panel discussion to share their personal experiences in following Venerable Hua in those early days. Themes will be “How far have we come?” and “Where are we heading?” There will be a multimedia slide show presentation as well as a photo exhibition on Venerable Hua’s 50th Anniversary of bringing the Proper Dharma to the West since 1962. His teaching, deeds, vision, and all the places he visited will all be included in the slide show and photo exhibition. The Dharma Realm Buddhist Association (DRBA) will gather material on the important events during the years the Venerable Master Hua spread the Proper Dharma in the West including establishing Sangha and branch monasteries, translating sutras, promoting education, and interfaith activities. Enumerating all of Venerable Master Hua’s activities will be calculated: taking refuge, transmitting precepts, lecturing on sutras, organizing Chan sessions, Amitabha sessions, Guan Yin sessions, Earth Store sessions, Repentances, Sutra recitations, and so on will all be included. Dharma Master Heng Sure, the chairperson of DRBA, pointed out that he would like to see this material serve as the official record of the late Venerable Master’s 50 years of teaching in the West and in the world. A memorial park and frescoes are also in planning. A senior disciple of Venerable Master Hua, Dr. Ron Epstein said that this is an occasion to let people know about Venerable Master Hua and DRBA and all that we have done and plan to do. Instilling Goodness Elementary School and Developing Virtue Secondary School students will perform Dragon and Lion Dances, Chinese Orchestra, and Chinese Dances during the celebration of the 50th Anniversary of Venerable Master Hua’s bringing the Proper Dharma to the West. There will also be an essay competition and a Vegetarian cooking Competition. Dharma Master Heng Sure welcomes more ideas. Please submit ideas to CTTB Administration Office, Tel: (707) 462-0939 or send email to paramita@drba.org.